Chrom Activ is a dietary supplement which provided 200 µg of chromium ions in a single serving. Chromium is an element crucial for many processes occurring in the human body system. It is responsible for the maintenance of the proper amounts of glucose in blood (especially in obese people and those with insulin resistance) and the proper fat metabolism. Nowadays, chromium deficiencies are very common. The factors that promote its loss include improper diet, excessive physical effort, pregnancy, infections and injuries. Deficiency of this element can be associated with improper functioning of the cardiovascular system and type 2 diabetes. Chromium is an element which is absorbed mainly in the large intestine, where it is bound to a protein, transferrin. Transferrin receptor is placed on the cell membrane and it is activated by insulin action, which allows for chromium transport into the cell. In cytoplasm and the cell nucleus which are insulin sensitive, there is an inactive oligopeptyde called apochromodulin, which, after binding to 4 atoms of chromium, is activated to chromodulin. Such a complex binds with a beta-subunit of activated insulin receptor, which results in an activation of tyrosine kinase and improvement in the signal sent after insulin action. The result of such action is an increase in GLUT4 protein functions, which is responsible for the transport of glucose into the cell to resynthesize the muscle glycogen. Thanks to that the high blood sugar is reduced to the physiological level. Moreover, chromium is responsible for the proper activity of enzymes regulating fat metabolism, which is why it affects the proper cholesterol level and the optimum relationship between its fractions as well as it reduces triglycerides level, which is important for the functioning of the cardiovascular system. Next to the influence on the metabolism of valuable nutrients, chromium causes the increase in tryptophan, which is the basic substrate for the synthesis of serotonin, which is called a happiness hormone. Moreover, the hormone is important for reducing appetite, which facilitates avoiding sugar and unhealthy food during reduction. Chromium positively affects the immune system, which helps to reduce the risk of diseases during reduction. 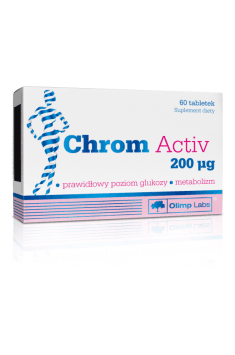 The supplement Chrom Activ is intended for everybody who observes the deficiencies of this element in his body system, and mainly for people who want to stay fit. Moreover, the element has a scientifically proven influence on insulin action, which is why it regulates blood sugar which is beneficial for fat reduction. It also helps to maintain the proper functioning of the cardiovascular system, whose disorders nowadays cause severe diseases. 1 tablet a day after a meal or otherwise after consulting a doctor. Chromium has the ability to increase cell sensitivity to insulin, thanks to which its supplementation during a meal rich in carbohydrates may contribute to lowering its glycemic index. It is especially important in the case of people who has to control glucose level in blood – people with diabetes, those who try to lose weight and those who have a tendency to eat excessive amounts of sweets. Olimp is a Polish company offering dietary supplements and supplements for athletes that are made of carefully selected and safe for health ingredients. Among the products of this brand are protein supplements, amino acid supplements, pre-workout supplements and creatine. The company also allows the purchase of supplements inducing a strong muscle pump by raising significantly the level of nitric oxide in the blood and supplements restoring acid-alkine balance. Also noteworthy are supplements helping to reduce body fat, regulating metabolism and improving of the hair, skin and nails. microcrystalline cellulose - bulking agent, calcium phosphate - firming agent, potato starch, magnesium stearate - anti-caking agent. Probiotic supplement specially designed for ladies. Supports the health of the sexual and urinary system. Supplement that contains extremely high dose of probiotics. Methylcobalamin is the form of vitamin B12 active in the central nervous system. Five strains of probiotic bacteria. It supports the proper functioning of the digestive and immune system. The preparation contains 10 unique strains of probiotic bacteria. It supports health of the digestive system.